Can the cloud software company keep climbing after its 80% rally this year? Shares of Adobe Systems (NASDAQ:ADBE) recently rose to an all-time high after the software company's third quarter numbers easily beat analyst expectations. Adobe's revenue rose 24% annually to $2.29 billion, clearing estimates by $40 million. Its non-GAAP net income rose 57% to $860 million, or $1.73 per share, which topped expectations by four cents. On a GAAP basis, its net income rose 59% to $666 million, or $1.34 per share. For the fourth quarter, Adobe expects its revenue to grow 20% annually to $2.42 billion, compared to the consensus estimate of $2.41 billion. Adobe seems like it's firing on all cylinders, but its stock already surged nearly 80% over the past 12 months. Is there still room for this stock to run, or should investors wait for a pullback? Adobe generates most of its revenue from two main businesses: the Digital Media unit, which houses its flagship Creative Cloud services; and the Digital Experience unit, which provides cloud-based marketing and analytics tools. Adobe's Digital Media revenue rose 27% annually to $1.61 billion during the quarter. Creative Cloud revenue accounted for $1.36 billion of that total. The remaining $249 million came from its Document Cloud business. The Digital Media unit's total ARR (annualized recurring revenue) rose $339 million sequentially to $6.4 billion. Adobe attributed that growth to subscription gains across the US, Europe, and Asia, strong momentum in emerging markets, rising app subscriptions, the retention of users upgrading from promotional to standard prices, and increased seats across the enterprise market. Adobe's Stock (stock photos), Acrobat (documents), and Sign (e-documents) software platforms also generated high double-digit sales growth. Adobe's Digital Experience revenue grew 21% annually to $614 million. Within that total, its subscription revenue rose 25% annually. Adobe attributed that growth to the strength of its Analytics, Marketing, and Advertising Cloud products. Its Audience Manager (data management) and Campaign (marketing campaign) platforms were also standout performers. Adobe also noted that Magento, which it acquired earlier this year, was "off to a strong start" and generated $27 million in subscription and services revenue during the quarter. Magento is a web store that helps merchants digitize their businesses with websites, ads, payments services, analytics, and customer relationship management (CRM) services. A recent Reuters report also claims that Adobe could purchase cloud marketing software firm Marketo to further strengthen that business. That could be bad news for Shopify (NYSE:SHOP), which competes against Magento in the fragmented web store market. Adobe's total subscription revenue grew 29% annually during the quarter and accounted for 88% of its top line, indicating that its multi-year shift from selling licensed software to cloud-based services is paying off. 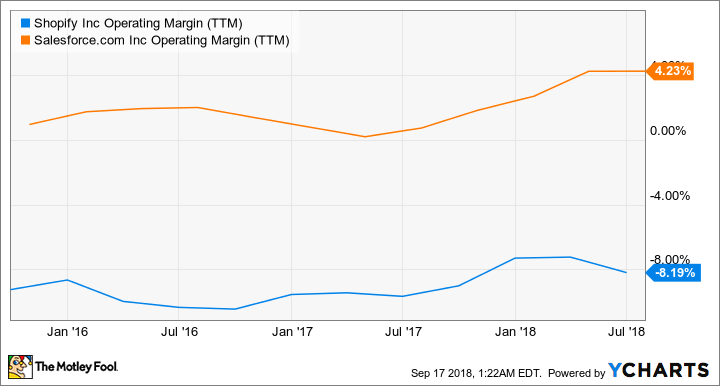 Adobe's scale also gives it superior margins compared to smaller rivals like Shopify, which has negative operating margins and remains unprofitable on a GAAP basis. Moreover, Adobe's "best in breed" reputation in the digital media market, with products like Photoshop, After Effects, and Premiere, gives it a wide moat and immense pricing power -- two advantages which many cloud service players lack. That's why Adobe maintains higher margins than its cloud rivals like Shopify and Salesforce (NYSE:CRM), which leads the CRM market but faces tough competition from companies like Microsoft. Does Adobe still have room to run? Adobe trades at 36 times forward earnings, which is a surprisingly low valuation for a high-growth cloud company. For comparison, Shopify trades at over 260 times forward earnings, and Salesforce has a forward P/E of nearly 60. Adobe's flagship products also don't face any meaningful competition, and its expanding cloud platforms should give it plenty of room to cross-sell and up-sell new services to its locked-in customers. That strategy should help Adobe generate even stronger sales and earnings growth over the long term. Therefore, I think Adobe could still climb higher over the next few years.